Are you stuck with poor sales on Amazon? DON'T BE! There is no need to suffer from poor sales on Amazon - why let your competitors sell more than you? Creating Amazon product listings requires care, attention and the right sort of experience. With our UK based Amazon Product Listing Optimisation experts to help, you can win the sales you need. There are many different elements that make up an Amazon listing, and getting any one of those wrong, or choosing to ignore them, will result in your products not being found on Amazon and your sales being poor. Are you able to create Amazon Search Engine Optimised Listings, do you need help? Getting your products found in search is the first step in increasing your position on Amazon and in increasing your sales and sales rank. Increase your search volume and see your Amazon sales increase as well. See your sales increase in just a few days! We are expert in generating sales for Amazon sellers by optimising their Amazon product listings. Call us today on 01786 430076, our UK Amazon Consultants are here to help you sell more fast. Contact us today for Amazon listings that work!! A great use of bullets in a Product Listing! Each product listing on Amazon is made up of a few critical elements: elements that you must get right! Product title: Use all the characters - make sure you say what it is, colour, size, brand, material. Rush this and you lose sales. It has to be a keyword rich title to work well, and to make sure Amazon search engine optimisation work for you. Product description: Sell it here! This is where you describe why it's such a great product and why it's the perfect item for the shopper. Work on your description - don't just cut and paste descriptions from a supplier catalogue. Bullet Points: These appear in the top half of your Amazon product listing. They are the key text that the eye scans to. Build short sentences to highlight the main features and benefits. Product Image and images: 1000px wide will allow zooming, no logos or watermarks and a nice white background are the standard. Amazon is very strict. The more you can upload the better - a close up of an area is useful to the shopper when a detail is important. Keywords: There is no need to repeat keyword & phrase variations in Amazon - it's very clever. So fill all the space you can with unique keywords, words that shoppers are looking for. Use Google or Amazon's Adword tool for inspiration if you get stuck. Category: Make sure you list in the correct category, check your competitors if you can't decide. If you list in the wrong category then you are unlikely to be found. Technical Specifics: Each category has it's own specific area for additional information. It could be ingredients - vital to many. So don't take shortcuts: fill in all the information. This is essential if you want to compare to other products when a shopper looks across the various options open to them. It is always good to learn from the experts, so why not look at how your competitors name their items. A little competitor research will reveal a lot. Find the top few ranked items that compete with you directly in your category and take a few notes. How do they describe their product? What have they done to make the title summarise the product well? It can be tempting to use a name for your item that is a little bit different. But all this does is make your item difficult to find. Use your brand by all means in the title, but give your product it's common name, that way people will search for it and find it. A good trick in writing compelling copy for product description on Amazon is to list the type of people that will likely buy it. And then list the reasons that each particular person will purchase it. You might find the reasons are slighly different: is the item stylish to some but perhaps a functional necessity to others. Wellingtons for instance have a mixed user base - think "Hunters". Once you have that list you can decide where to push the copy. Should it cover all the bases or should you concentrate on the largest group of buyers. You can also note down the likely keywords shoppers will be searching for and weave these into your description. This will strengthen the search optimisation. Make sure you do the keyword research, you can use the Google Keyword tool for some inspiration. Online sellers often rush the bullet points, but each bullet point can be a meaningful sentence selling the product; as opposed to a quick one or two word key feature. Many Amazon sellers creating listings don't use the bullets effectively, but they are on the top half of the page and are where the page visitor will first decide if the product is for them. Spend time with your bullet points - they are essential in catching the shoppers attention. You have 255 characters for each bullet point, and that is a lot to play with. Describe the products features and benefits well and you will convert browsers to buyers. Conversion rates can be improved with a well thought out product description, which includes the products features captured in bullet points. For each Amazon Product Listing there is space allocated for up to 255 characters - so make sure you use the character limit as far as possible. The keywords are there to help Amazon index your items and help it understand what your product is all about. You fill the keyword space up with the words that best describe the product. You can use Google or eBay or Amazon's Adword tool to help you find the sorts of words that buyers might be searching with. You don't put comma's between the words and you don't repeat the words. Amazon will figure everything out, including plurals. Getting your Amazon SEO correct will make a significant difference to selling on Amazon. Amazon listing optimisation is all about the small details. Get the product titles right , the description and keywords right and you'll have great product titles that improve your conversion rate. There are a lot of categories and it's easy to end up in the wrong place with the wrong product. As way of checking the desired product category it's best to look at your competition. Where are they listing? Do some competitor research. This is where you will be expected to list your product and this is where the shopper will search. If your sales are poor it's worth looking at the category with a fresh pair of eyes. It may be a category that is a little too obscure, or perhaps you haven't drilled down deep enough to the correct category. 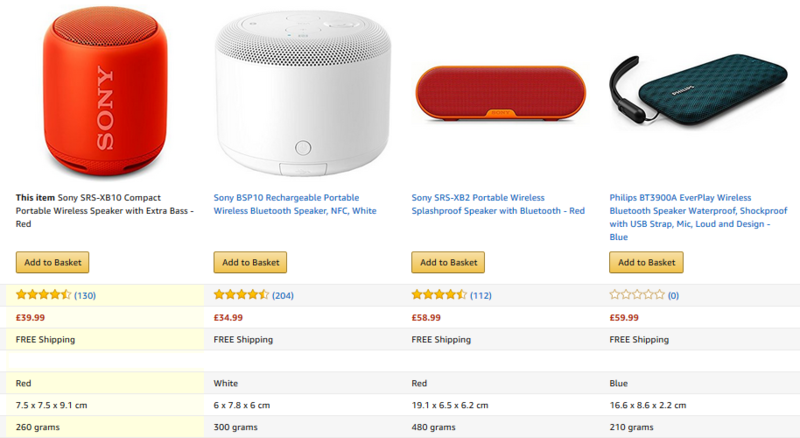 You'll also find that when you choose a category that specific information is requested and this is important if your item is being compared, using Amazon's comparison table, to other items. So find the right category. Once you have identified the correct product category it's important to make sure you fill in all the category dependent data. This can be for things like ingredients, and is therefore vital to the potential customer. Or it could be a technology item, where the shopper will compare your Processor Speed or Memory Size against all the similar products. If you do not fill in all the product information you will damage your search results and you will lose sales to more thorough competitors. Amazon have made digital marketing as simple as possible, all you need do is optimise Amazon a little in your favour. Get started today - you'll see Amazon SEO improvements in days! 1. Research the keywords using the various online tools that are out there - the Google Keyword tool for instance. You can use the Amazon Spoonsored Listing tools to do a little research. Fill up the available space as best you can, up to the character limit ideally. 2. Have a look at your competition's titles, what are they calling their item, what keywords have they squeezed into the title. Use brand and colour etc, but make sure you use the common name. A competitors product listing can tell you a lot and give important amazon product listing optimisation insights. 3. Have a look at the product category options and find where your competition are. Don't get the product category wrong. 4. Get those bullets looking fascinating and dynamic. Pack them with great information on product features and benefits. This is where shoppers decide if they are hanging around. 5. Make sure that the Amazon Description reflects why people want the item. Why should they buy this one as opposed to anything else. 6. Don't ignore the Technical information area: this is where many a sale is lost because online sellers were not dligent enough. This is where the shopper makes the final decision to buy. 7. And product image: if you don't have good product images - get them! You won't sell without them. So get some good product photography done, especially if it is a private label item. Complete the technical information so you can be compared in the Amazon comparison table! That will improve your conversion rates. Don't suffer in silence! It's time to get the Amazon Product Listing and Amazon Search Optimisation help you deserve. We are a UK based team and available on 01786 430076, call us to discuss what the problem is - we'll have it fixed fast. Contact us today for Amazon Listings that work!